OXFORD, England (CNS) — A Catholic aid worker warned of a worsening crisis in the Central African Republic, as church centers are attacked and more armed groups fight over territory and resources. “Perhaps the situation is better in Bangui, the capital, but elsewhere conditions are deteriorating dramatically as conflicts multiply,” said Christophe Droeven, country representative for the U.S.-based Catholic Relief Services. “At least 100,000 people have been displaced by fighting since April, and the number here and abroad now totals close to a million. Nongovernmental organizations are being increasingly targeted, and it’s becoming harder to help those in need,” he told Catholic News Service July 24. He said aid organizations had evacuated their representatives from Bangassou to escape “looting and harassment” by a mainly Christian militia, Anti-Balaka. He said troops with the U.N. peacekeeping force, MINUSCA, had been unable to protect aid convoys. Bangassou became a flashpoint when heavily armed rebels attacked its Muslim quarter May 13, cutting telephone lines and leaving 115 dead, including six MINUSCA soldiers, according to the International Red Cross. In a July 24 statement, MINUSCA said the city’s Catholic cathedral, which is currently sheltering more than 2,000 displaced Muslims, had been attacked and robbed, and neighboring homes burned, when fresh clashes erupted July 21. It added that a Moroccan soldier had been killed and three others wounded when a U.N. water convoy was ambushed by Anti-Balaka fighters. Droeven told CNS he believed violence reflected attempts by rival armed bands to control the Central African Republic’s mineral resources, including diamond and gold, rather than political disputes. He added that Anti-Balaka had periodically allied with the country’s Muslim-dominated rebel Seleka movement “for certain objectives,” but said many armed groups were now outside the control of either. “Small bands now often claim to control the same territory, and we have to pass them all to gain access to the local population,” said the CRS representative. “Since they don’t recognize each other, this is complex and risky, as we try to explain our work and underline our neutrality. If one group isn’t informed and controls the road we’re using, we can quickly find ourselves in trouble,” he said. The Catholic Church’s nine dioceses make up a third of the 4.5 million inhabitants of the Central African Republic, one of the world’s poorest countries. Seleka rebels seized power in early 2013 but were driven back after the January 2014 deployment of 13,000 French and African peacekeepers. Catholic parishes and dioceses have been praised for sheltering displaced people around the country. However, Bishop Juan Aguirre Munoz of Bangassou told the Vatican’s Fides news agency July 24 half the city’s 25,000 inhabitants had fled the latest violence, many to the neighboring Congo. He confirmed his cathedral had been damaged and burned by “young Muslim extremists,” who also temporarily seized employees of Caritas and their families. 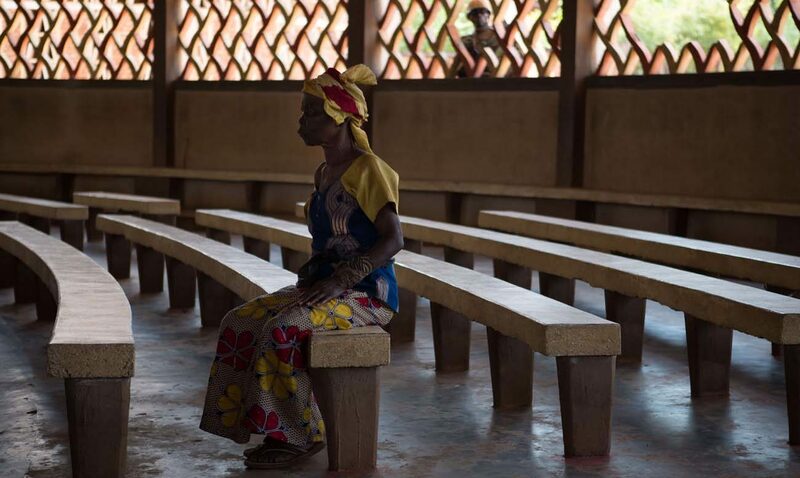 The African Press Agency said July 21 Saint-Louis Catholic parish Bria, which is also sheltering hundreds of displaced people after May-June clashes, had been attacked and robbed by armed men after failing to receive MINUSCA protection. Droeven said the Catholic Church was now the “only functioning structure” in many parts of the country and was viewed by Christians and Muslims alike as a refuge. He added that Cardinal Dieudonne Nzapalainga, president of the bishops’ conference, had “placed himself at great risk” in May, when he personally intervened to restore peace in Bangassou. He noted that Catholic, Protestant and Muslim leaders had often worked together for peace at local level. “The church has become the first place for finding a safe haven in times of strife; people know priests will protect everyone,” Droeven said. The Rome-based Community of Sant’Egidio announced June 19 it had arranged a peace accord among the Central African Republic’s armed groups. Cardinal Nzapalainga criticized the accord, saying he believed the text offered “an open door to impunity for crimes committed” and denied claims he had been represented.